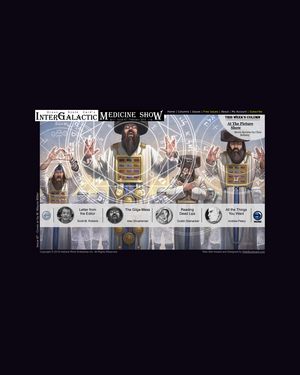 Orson Scott Card's InterGalactic Medicine Show is an online fantasy and science fiction magazine. We are a publication featuring content from both established as well as talented new authors. In addition to our bi-monthly issues, we offer weekly columns and reviews on books, movies, video games and writing advice. We are looking for stories of any length in the genres of science fiction and fantasy. "Science fiction" includes hard sf, sf adventure, alternate history, near-future, far-future, psi, alien, and any other kind of sf you can think of. "Fantasy" includes heroic fantasy (based on any culture's mythology), fairy tales, contemporary fantasy, and "horror" in the sense of supernatural suspense (not gory bloodfests, thanks). Within these genres, we like to see well-developed milieus and believable, engaging characters. We also look for clear, unaffected writing. Asimov, Niven, Tolkien, Yolen, and Hobb are more likely to be our literary exemplars than James Joyce. FFantasy Fantasy Open to all/most Subgenres, including: Contemporary, Heroic Fantasy. SScience Fiction Science Fiction Open to all/most Subgenres, including: Alternate History, Contemporary/Near Future, Hard Science Fiction.